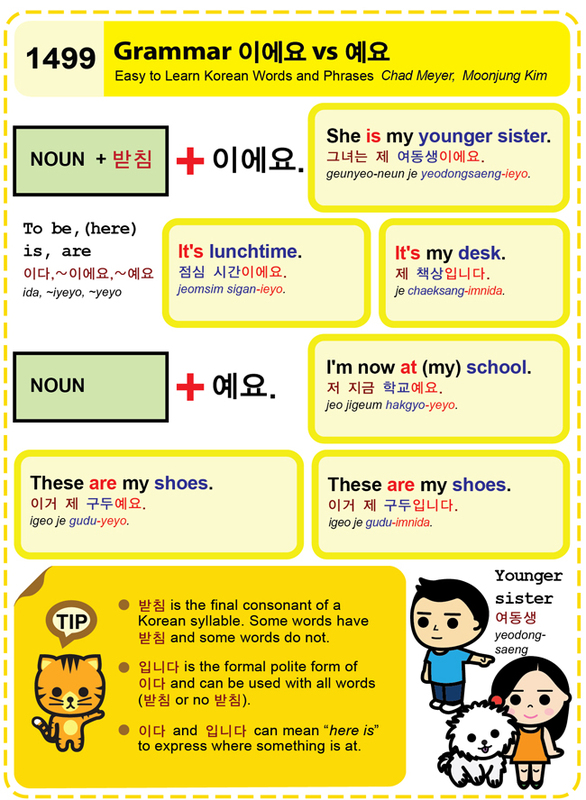 Easy to Learn Korean 1499 – Grammar 이에요 vs 예요. Posted in Series	| Tagged (here) is, are, Grammar 이에요 vs 예요, I'm now at (my) school., It's lunchtime., It's my desk., NOUN + 받침, She is my younger sister., These are my shoes., To be, younger sister, ~예요, ~이에요, 그녀는 제 여동생이에요., 여동생, 이거 제 구두예요., 이거 제 구두입니다., 이다, 입니다, 저 지금 학교예요., 점심 시간이에요., 제 책상입니다. Easy to Learn Korean 996 – How to greet colleagues and customers.